Stardock are continuing to build an awful amount of infrastructure for their next generation of games. Not content with moving their games over to 64-bit, or financing a new studio to produce a dedicated engine for strategy gaming, Stardock are now working on creating their own cloud-based service. To build it, they’ve brought in Adrian Luff, a former Battle.net engineer with 17 years’ experience at Blizzard. Online services and “connected gaming” might smack of DRM by another name, but Luff is emphatic that this is not the case. “We are absolutely not changing our stand on DRM. In fact one of our design goals is to avoid any dependency between the single player game and Tachyon,” Luff said. 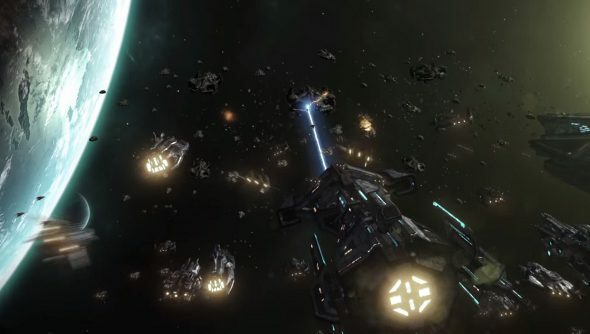 Stardock are in an interesting place right now: while they’re still working toward the launch of their next entry in their flagship series, Galactic Civilizations 3, the company overall is making a series of long-term bets on infrastructure and technology. While games like GalCiv or Mohawk’s Offworld Trading Company get all the attention, and justifiably so, Stardock have started laying an awfully deep foundation for the next round of games they develop and publish. Now, with Tachyon, they’re pushing into expanding their online services. Nevertheless, a new backend service is hardly the kind of thing that sounds very exciting if you’re a player. Luff doesn’t try to deny it, but points out that Stardock’s embrace of the cloud will give them far more flexibility than they’ve had in the past. That allows them to try new things with their services, which could translate to better, more user-friendly experiences than players have had in the past. “Traditional publishers are very risk adverse. Spending money on hardware for a game or feature which isn’t guaranteed to move units is unacceptable,” he explained. “That’s one reason why launch day for many games is so uncertain. Publishers must often guess at early sales then try to predict demand. They must buy hardware to support the game months in advance or pay extra for on-demand hardware. The issue for publishers like Stardock is that the up-front costs of setting up online services have historically been prohibitive. Cloud-based computing has changed that, and ironically, it’s actually more reliable and offers Stardock more control over their own service than attempting to bring the infrastructure in-house would have provided. “Cloud providers free us from managing many of these details,” Luff explained. “They can automatically configure additional servers as needed to meet load on launch day. If a database is growing too large we pay a bit more money to increase storage capacity instead of buying a new, expensive SAN (storage area network) array. Less people and fewer problems so more money is spent on the game’s development. “It does require extra effort to fit into the cloud’s restrictions. Fortunately Stardock isn’t saddled with an existing platform to support. We’re building it from the ground up to take advantage of the cloud features and manage its limitations. Luff also points out that cloud-computing providers like Amazon and Microsoft are able to invest a fortune on risk-mitigation, while a company Stardock’s size could never afford to create that kind of reliability and redundancy themselves. We’ll see. This is an increasingly murky area for games: as more and more features become dependent on an outside service, it’s an open question as to how much of your game you’ll still have in years to come. On the other hand, there is considerable convenience to some of these services, and Luff specifically said that one of the benefits of locating it in the cloud is that it’s easier to maintain legacy support (as opposed to EA’s aggressive server shut-downs). Stardock aren’t trying to re-invent the wheel here: they plan on continuing to use Steamworks “where it makes sense”, such as when dealing with friends lists. But they also want to give their developers more options. 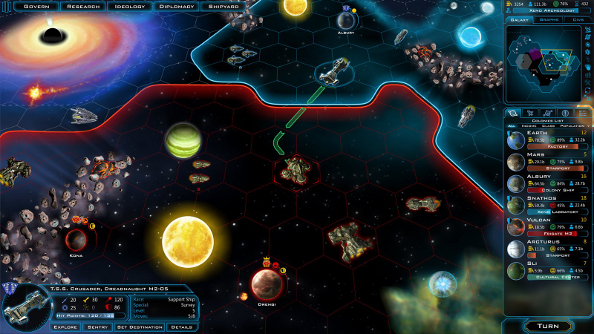 We won’t see what Tachyon can do until Stardock roll out the service in 2015.